Even though things are working and we’re still feeling that swagger, sometimes we just need a makeover, right? That’s how I felt about Lucky. She was still walking the walk and for sure talking the talk, but she needed a fresh, sassy exterior to go with that moxie. And when a gal gets some fancy on, what does she need? And what does a party call for? Well, gifts, of course. Lucky has pulled some serious swag from the Babylon, swag you can’t get anywhere else. And we’ve put together boxes of fluffy robes and Champagne flutes, and bath bombs, candles, and some Lucky playing cards…all sporting the Babylon logo. Oh, and there’ll be books, too, of course, all with the fabbo new covers. So, check out the giveaways, eight of them—one for each of the Lucky books. These will run for one day each starting today, November 14th! Then a grand prize starting after the eight individual giveaways on November 22nd and ending on December 13th. You’re gonna want in on this one! Check below and enter to win! As a note, the giveaways are running on EDT—so all times for the opening and closing of entries will be on East Coast time. Deborah Coonts swears she was switched at birth. Coming from a family of homebodies, Deborah is the odd woman out, happiest with a passport, a high-limit credit card, her computer, and changing scenery outside her window. Goaded by an insatiable curiosity, she flies airplanes, rides motorcycles, travels the world, and pretends to be more of a badass than she probably is. 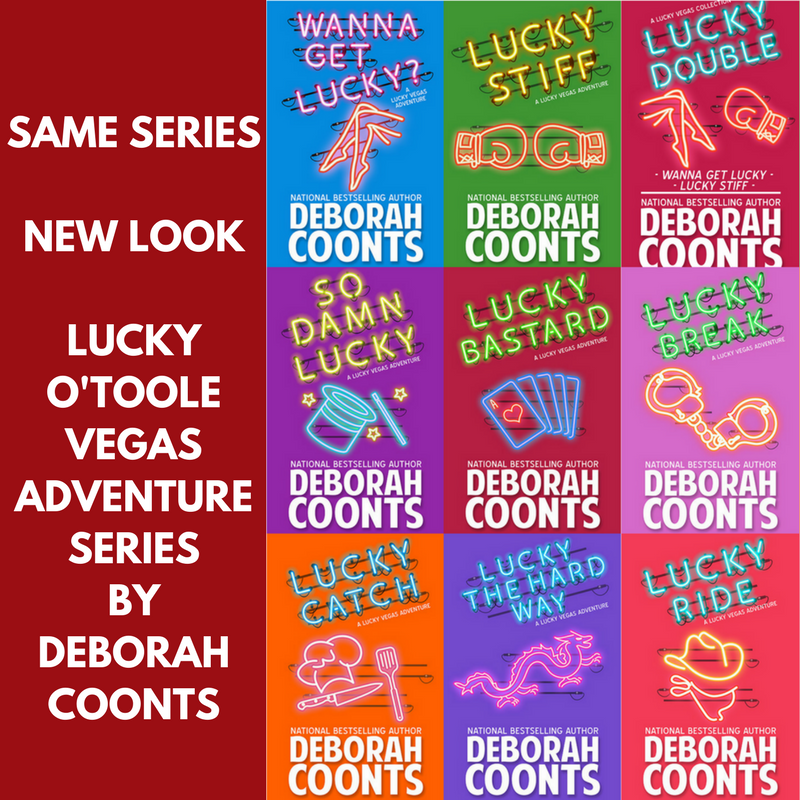 Deborah is the author of the Lucky O’Toole Vegas Adventure series, a romantic mystery romp through Sin City. Wanna Get Lucky?, the first in the series, was a New York Times Notable Crime Novel and a double RITA ™ Award Finalist. She has also penned a few standalone novels; After Me, a medical thriller, Deep Water, a romantic suspense, and Crushed, a contemporary romance set in Napa. Although rarely there, Deborah calls Houston home. You can always track her down at www.deborahcoonts.com. This contest is a fantastic idea!! I just started Lucky Ride the other day… Finished Lucky the Hard Way this past weekend. Wow, they really do keep getting better and better. I’ve read many book series but I usually get bored by the 4th book… Lucky is just so cool and self deprecating that she becomes so REAL. I just loved how you brought the Patek Philippe pocket watch into the last book. I researched the watch so that I could understand the value better. What an incredible time piece! Please let me know if the lucky bathrobes are ever for sale. That would be amazing!! Have a great day, Deborah! You have no idea how happy you’ve made me! I hope the Lucky stories get better and better and I improve as a storyteller! Those are the goals! I try to incorporate things that I stumble across and find super cool–that keeps me super engaged as well. I will probably sell some Lucky Loot, if you will, but I especially LOVE to offer it to Lucky’s readers as a way to say a special THANK YOU!!! After all, you allow me to do what I love and I am forever grateful. Thank you! I LOVE them, too! So happy you do as well. I think they just scream “Lucky fun!” I’m scribbling on the next one and having a blast. I hop you’ll love it, too! Thanks & Happy Holidays Deb & Everyone! Thank you! And the same to you!! These books have brought me many hours of escape from reality. Gives me the relaxation I need while still keeping my brain activated. I am so glad that I found them! Hope! Thank you SO much!! Lucky has actually given me the same thing–along with some much needed therapy:) I’m so glad you found us both, too! Thank you for your kind words and wonderful support! Thank you! I hope you and Lucky get along! I love reading your Lucky books! They are always such a fun read! Thank you!!! We all need a bit of laughter, for sure!! Can’t get enough of lucky, love her attitude. Thank you! As my aunt told me after reading Wanna Get Lucky? way back when: “Lucky is the woman you (meaning me) want to be. )” Yes, well, hard to admit, but she was right, I’d love some of Lucky’s moxie!! So glad you enjoy Lucky as well! I love lucky, but I really miss Teddy. I don’t want appear mean, but I hope the french chef goes away—soon. Looking forward to the new Lucky book in February!!!! I’ve read all the Lucky books and love, love them all. Looking forward to the next one. The new covers look awesome. Continued success to you Deb. Thank you SO much!! Yes, we’ve emailed before–I so appreciate your continuing support! I’m glad you like the new covers. I’m VERY pleased with them! And to you continued success as well! I found lucky by accident, and to use your catch-phrase, guess I got lucky that day. Teddie just took off to ‘help’; honestly, do men ever? Common sense does not seem to be ingrained in their DNA. I would prefer Lucky to get a man she deserves,to me; that rules out Ted. I confess I’ve read very few books by lady authors, but having ready 2 “Lucky” books, I’ve seen the error of my ways. I love your books! Most entertaining! Keep up the good work. (Ps. I loved Stephen’s too! It was the sirname that lured me to try your writing, and I’m very glad I did!). What a nice note! Thank you. I’m very happy to have been able to convince you that female authors can capture you, too! I appreciate you giving my stories a try and I’m glad you found them to your liking! All the best and have a terrific holiday season! I can not get enough of the Lucky books. I just love them! They have made me laugh and they have made me cry. I buy them as soon as they come out and I am sad when I am done reading them because I WANT more. I have every book and I would recommend them to anyone. you are a great author Deborah and looking forward to many more adventures ahead with you. Thank you SO much! !Wow, you really go my day off to a fabulous start!! I so appreciate your kind words and continuing support!! I read and loved them all! Each book is like joining a friend for a fun and exciting week or two of mystery, and most of all FUN!! From getting to know her loves, her friends and her family and of course her car, it is just a good ride. Omgosh I cannot wait for February! Love your books and love Lucky —-yes we all wanna be just a little bit like Lucky. Thanks for keeping the dream alive ???? You rock ! The dream is alive and well!! If Lucky can do it, so can me, right? Thank you so much for your support! LOVE these books! They grab your attention on the very first page. Lucky is my spirit animal and my escape. I cannot wait to read “Lucky Ride” – you know I have been waiting for that book. 🙂 Thank you for keeping the Lucky series exciting and fun! Your spirit animal–I LOVE it! Thank you for your taking the ride with Lucky and me. I’ll do my best to keep the books exciting and fun! Thank you! I have a terrific amount of fun writing them! I have to say that right from the very first page in “Wanna get Lucky” I was hooked on Lucky O’toole. This is a series that I binge read and couldn’t put down, and with the exception of her bank account I am finding alot of myself in Lucky…especially our snarkiness and self deprecating humour. I am so looking forward to more books in this series as you have been one of my favorite authors for some time. Thank you for giving me so many hours of entertainment and for allowing me to share in Lucy’s journey. Tanya! What lovely note. Thank you!! I so enjoy writing Lucky with her sass and snark, and self-doubt and vulnerability. I’m glad you enjoy her as well. I hope you have a fabulous holiday!! Thank you for sharing Lucky’s journey with. Your support and kind words are the best present an author can get! I enjoy reading the Lucky series. They are great. I do enjoy the Lucky series. They make me laugh and I end up reading snippets out loud to my family when my teenage boys ask me what I’m laughing at. Great way to kick back and free the brain at the end of a work day. Thank you for that! Happy Holidays. Thank you, Pam! What lovely praise indeed. Kicking back, some fun laughs: exactly what I strive to provide. Thanks for letting me know I succeeded!! I appreciate your support very much! Happy holidays! Thank you so much! As you might be able to tell, they are great fun to write! So glad you enjoy them! Loved this series of books! Will there be more???? Thank you! You bet there will be more! LUCKY SCORE is up for preorder now and will be out on February 7th!! Thanks for asking! Love your books. They always give you a surprise ride! Thank you! A surprise ride!! Yay!! I try to do that–it’s great to know I pull it off! Have a great holiday season! I’m so lucky that I met Lucky. She’s great. I’m thankful & Lucky your kindness sent me 2free Lucky books. It was so appreciated due to serious hard times but I’m going to get lucky soon. Thank you for your love of your readers and we love you gal. So glad you love Lucky! And I’m hoping hard times get way better soon! Happy holidays! Love ❤️ your books! Lucky ???? is so much fun. Always looking forward to the next one. I signed up as required but never received the free books, just thought you should know in case others have the same problem. Hey! Sorry for the hassle. If you’ll email me at [email protected], I’ll give you a direct link. Looks like I have some catching up to do! It works!! I’m so glad!!! Have a great holiday season!